Something that’s becoming a common theme on this blog is talking about how to handle different types of player actions in a manner dissimilar from modern games. There is a fine degree of control necessary when operating any sort of military vessel in space, and we want to give it to you. Aside from being able to target all of your weapons independently, you’ll also be able to directly control their AI actions by setting each battery to a specific mode. These modes are a little complicated, and still subject to change (as everything here is) but our intention is to allow you to perform behaviors you’re not normally allowed to perform. Not all enemy units will charge head on into enemy fire, some will turn and run away. A group of light fighters confronting a battleship alone, for example, will flee in the face of overwhelming firepower. But how do you convince the enemy that’s in their best interests? In this case the answer is Suppressive Fire, but there was no way for you to know that! So we’ll explain. This command is overwhelmingly obvious, it will force the battery to stop shooting and the battery will not engage in shooting again until the order is changed. This is the default mode for all batteries. This mode of fire is for approach or stealth situations. This is the maximum ammo conservation mode. This mode will fire every few seconds at a target, only when it is range and when it has the best chance to hit. That means if a target is moving towards you, it may not fire right when it enters range, but instead wait until it approach much closer then it normally would. The idea of this mode is that you can fire at an enemy without merely throwing out tons of ammunition in the hopes of hitting something, and more valuable weapon types (torpedoes, missiles, cruise missiles) will be more effective as they will be the most likely to hit. The rate at which a battery will start shooting at this mode is determined by the Lock Strength. Once you have targeted a ship, you must lock a target to engage it. Locks can range anywhere from 1% to 100%. This number determines the likelihood of a shot fired now reaching it’s target. This number will generally start around 25 and work it’s way up the closer you get to the target. Batteries set to restrained fire will not open fire on a target until it reaches at least 85% lock strength. When set to this mode, a battery will fire until it’s ammo is expended. This mode is best set when you are trying to destroy an enemy to escape a battle – every shot will count. Sustained fire is very similar to the above – except that rather then depend on lock strength to determine when it will open fire it depends purely on range. Once a target has entered range, the weapon battery will fire short bursts from its weapons every few seconds, maintaining ammo but also beginning to fire as soon as a hit is at all possible and stopping only when it’s ammo is expended. This mode is best set when you are just entering an engagement and want to inflict maximum possible damage on a target before closing to finish it off. This command will order a battery to fire at a target as soon as it enters range and not stop until it is out of ammo. This is slightly different then the sustained fire mode above because the battery will run out of ammo much quicker in this mode, as it does not stop occasionally to rest in between shots. This mode is best set when you are in the middle of a wild melee and don’t care what gets caught in the crossfire. This command will order a battery to open up immediately! It will begin firing at a target and continue firing at a target until it runs out of ammo or the target is destroyed. This command will deplete your ammo even faster then the previous commands, and worse, is not dependent on range or lock. This mode is best set when you trying to intimidate an enemy from closing. 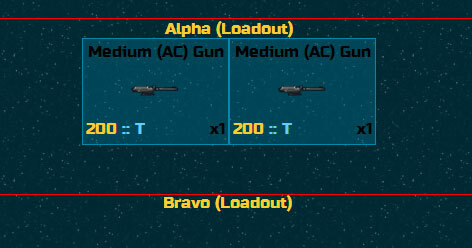 This mode can also be used for larger weapons – such as anti-Capital ship weapons – for targeting groups of fighters the battery might not otherwise be optimized to hit. With such a massive amount of fire power going out, the odds are good even one or two close misses can take out a target. That wraps up our notes on the various battery AI control modes. Stay tuned this week, we’re going to talk more about Target Locks and how to maintain them! Until next time, Sink Enemy Shipping! More fun with the inventory system last night, this time with most of the kinks worked out. Sometimes you just have to quit for the day and get some sleep, or you won’t get anything at all productive done. So let’s take a look at loading equipment. The first step you’re going to follow here is loading weapons from the Citadel Station Secretly Named Station to be Announced Later. This inventory, as we mentioned in yesterdays post, is shared with all the other members of your team. If there are 7 guns available, it’s not 7 guns for you, and your buddy, and your buddy’s girlfriend, it’s 7 guns split between all of you. Once you’ve pulled a gun out of inventory, it’s loaded onto your ship. Loading guns on your ship takes up valuable tonnage space that can be used for other components to help improve your combat capabilities. This tonnage is returned to being available when you unload equipment from your ship. In the image below you can see we’ve loaded four guns on board our ship. These are not out of the station inventory and can’t be used by other players in your group. Before you can use any of these guns, however, you have to load them into a weapon battery. 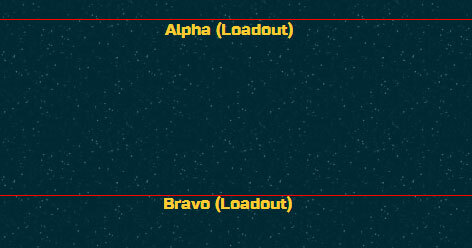 Every ship has four batteries (Alpha, Bravo, Charlie, Delta) that can be targeted independently of each other. As we mentioned yesterday, we are splitting the difference between letting every weapon target a different ship (programatically impossible) and every weapon targeting the same ship. You can see in the image below part of the ‘Tactical Screen’ that shows what weapons are available for loading, and the current target of two of the weapon batteries. Once you have some weapons in your inventory to assign, you have to select which weapon battery you want to load the weapons into (you can click anywhere in the general vicinity of the load out box to select this) You can see our empty load out box below (we’ve selected Alpha Battery in the image, evidenced by the red border). 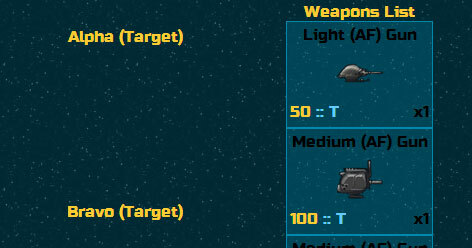 Once you have the weapon battery selected, just click a gun to add it to the weapons bay. You can see below we’ve now added two Medium Anti-Capital Ship guns on board our ship, and assigned them to Weapon Battery Alpha. Weapons not in a battery will not fire at anything, so it’s a good idea to make sure you assign everything in your inventory to a battery or it will just be wasted space! During the development of this feature set we ran into a number of problems. 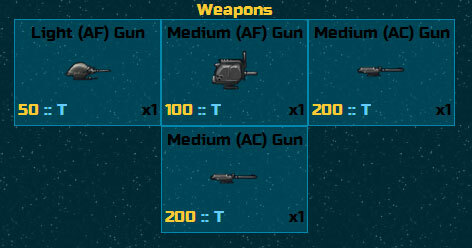 For example, players can remove a weapon item from their ship inventory to return tonnage space, which also means it has to be checked against the battery and removed from the battery (we default to removing ‘extras’ from the list before we start removing weapons from batteries, but sometimes you don’t have any extras to be removed!). We also needed the data to persist between sessions – setting up your weapon batteries is not something you should have to do every time you sign into the game. It’s easy during this process to forget the little things – like that we still needed weapons to show up in the inventory list even if some of them have been assigned, so long as there are extras in the inventory. In the end, we ended up scraping two whole functions and adding a new callback to execute the battery creation process at the end of the inventory loading process. All our attempts to do it all at once ended badly, and if there is one thing we have learned it’s that decoupled functions are easier to modify and change later in the future. Recently while working on an inventory system for Crawlspace, a discussion came up about the user interface that I wanted to share. We were discussing weather to implement a drag and drop system for the inventory. I should explain a little bit about the inventory system here so you can understand the following points. The inventory system for Crawlspace exists for a group, not for an individual. When an item is loaded onto a ship it uses tonnage aboard the ship, and is removed from the group inventory. For items like Radar or Hangers or ECM equipment, this is the final step to equipping it. Items like this cannot be assigned anywhere except in their assigned ‘grouping’. Radar and ECM for example are grouped under ‘Special Equipment’. Reactors are under the ‘Power’ grouping, and guns and missiles all fall under the ‘Weapons’ grouping. Initially drag and drop was planned for this feature, but after looking at the system we started to ask why. Traditionally in other games this is how we’ve seen it done – but let’s be honest. Are you ever going to drop a reactor in a radar slot? No? Then why not just let you click? Now instead of click/hold/drag/release you just hit a click – once – and the item slots into the appropriate grouping. This was great for general equipment, loading up my ship from the group inventory is quick and painless. But what about weapons? Weapons, in addition to being loaded on your ship, have to be loaded into one of four available ‘Gun Batteries’ on board your ship. Gun Batteries allow you to take five or six weapons of similar or dissimilar types and group them all together to fire at once. We realized very early on that capital ships don’t generally point all their guns at the same target all the time – it’s a massive waste of ammunition to shot a .50 caliber machine gun at a battleship three miles off – you use the main cannon for that (or even better – missiles). So we broke up the weapons into six categories – Anti-Fighter weapons, Anti-Capital ship weapons, with a light/medium/heavy version of each. This way you can group all your anti-fighter weapons together, or mix and match so you have four batteries of weapons that can shoot at anything. It wasn’t practical – from a programming standpoint – to give players the ability to fire all their weapons at independent targets. You could be stuck assigning 100 targets to 100 weapons. And it wasn’t fair to force the player to target one ship at a time – this is a major draw back from modern video games. You have a massive battle cruiser with a giant main cannon and six point defense turrets and send it after a building – and it attacks the building and dies to a single machine gun trooper because it’s point defense batteries are busy shooting at the same target. So for the gun batteries we needed a new solution – and now the process for equipping a weapon into a gun battery slot involves first selecting the weapon battery you want to assign guns too, and then clicking the guns out of the list the same way the main inventory assignment system works. While a drag-and-drop system would be ideal for this sort of situation, we felt that it disrupted the flow of the game. Having two different control systems to accomplish what (to the player) seems like essentially the same action means we have to write two different tutorials for managing the inventory system and the player has to remember two different sets of instructions for the same system. Just wanted to share this – it’s interesting to note that sometimes the ideal solution isn’t the right one for a given game. We’ll have more on this after it’s been turned loose to our Beta Testers. Story in Silent Space Rebellion is an essential part of what we’re trying to do. So many browser based games on the market – one of the things that sets us apart distinctly is that we have a specific and a unique story to tell. This story isn’t really the story of one character – though we have a group of characters along for a ride. We don’t ignore them either – but the story that we’re telling in Silent Space Rebellion is really meant to be a story about a ship: the SCT Joshua. The SCT Joshua is many things in our universe – it’s the underdog, it’s the rebel, it’s the hero ship. Each of these elements was picked to give the ship something about it that helped us tell the story, because the story is what we are all about. The underdog nature of the ship is more subtle – and only comes out if you pay close attention to the back story of the ship. The Joshua was not made to be a front line combat unit. It was created for just one purpose: orbital bombardments. Neither as well armed nor as fast as the heavier battleships and larger ships of the line in the DDF fleet, it was listed as scrap and sold off to the SCT without the knowledge of the DDF. The Joshua is one of the first of these boats – before the SCT started upgrading and outfitting them better. This element of the story helps us show how exceptional the crew and characters are in our universe – they’re doing the special operations better than anyone else, even with substandard equipment. The rebel nature of the ship frees us from having any sort of chain of command limitations – we certainly do see the SCT High Command (and even aspects of its military command) but ultimately the ship is free to do things that a ship operating in a normal military hierarchy might not be able to do. We’ve deliberately avoided situations like this to avoid the player having to look at the game and ask themselves “What would the commander say if he knew what his ship was doing?”. Consequences are a real thing in the real world – and a great way to ground our game as something believable. The heroic aspect of our ship comes out of necessity. Ever story has a driving element – something that keeps the plot moving forward, such as a McGruffin. In this case, our element moving the story forward is this one ship – whose affect on the war and on the universe at large have a disproportionate effect to their size! For many years the Developers at Intertainment Games have believed that Video games are a great way to tell a story – it’s much more than just entertainment, it’s an interactive experience, and that’s what we’ve tried to do with Silent Space Rebellion – we hope you’ll agree that we’ve done a good job! Silent Space Rebellion has four distinct types of movement. They all flow seamlessly into and from each other, but the system can be overwhelming at first glance, so in preparation for our upcoming Beta Test we’re going to outline the four types of movement here so you can understand the systems at work before being captured by the game. Combat movement is the simplest form of movement in the game. You pick a heading, and set your speed, and your ship moves out. This form of movement is the most ‘open’ but is only available during combat situations for reasons we will explain later. This sort of movement gives you little time to react to an incoming threat, and requires careful use and control of in order to make the most of your available weapons and equipment stored on board your ship. In this form of movement you are hunting individual ships to destroy. This mode can be reached by engaging a fleet, or being engaged by a fleet. Solar movement takes place around the star of the solar system you’re currently engaged in. This type of movement is grid based – with your ship moving left / right /up /down and along diagonals to scan different grids of space. This type of movement was deliberately chosen for this part of the game in order to enhance the feeling of ‘the stalk’ that is such a part of the cloaking system in our game. In this form of movement you are hunting for a fleet to engage in combat with. If the fleet finds and detects you first though, you’re immediately engaged in combat! System movement will move your ship by ‘jumping’ it through the Hyper Gate to a particular destination. No enemies are present in this mode, and the player has free reign to move around between solar systems at this point. It is possible to scan into the system before entering it, without being detected. The simplest of all movement (our Facebook page has a picture of this here!) this form of movement will allow you to deploy your ship through a Far Jump to another sector in the game. We know you won’t understand much of this until you can see it in game (maybe in our upcoming Beta Test! ), and we’ll have some more details coming soon! Wednesday’s update was about the Combat Screen, but there are lots of places we’ve improved the UI, from the top menu with a new bar showing you relevant stats to the torpedo icon images over the skill bar showing you which tubes are loaded (which is necessary in combat, as any Captain can attest to)! Today we wanted to talk about the importance of your actions having direct input. A lot of the browser based games that we’ve seen out there have you click a button, and then they provide you with delayed feedback. You might get a dialog that pops up, or the data on the screen might change slightly to reflect that you just did something – but that’s the end of the action. We’re not like other browser based games (we’re sure you’re already knew this, but it’s one of our talking points about the game so we’re going to keep bringing it up). In Silent Space Rebellion when you click on something, something happens right then and there. Drag a torpedo, your ship is loaded. Target a ship, and you’re going to engage in combat. Move grid squares and your radar will start sweeping your new location for enemies to take down. In the interest of reflecting this principal everywhere in our game we’ve taken the Torpedo Loading menu and made some significant changes to it. The panel in question used to slide out of the left side of the screen and then have a series of selection tabs across the top. This was perfectly acceptable, and after much debate around the Developer table about which tab was most important, the Torpedo Tab was loaded by default. This debate is what sparked the change – some players felt adjusting power was more critical to see first, some people felt that managing your gun load out was the most important thing. It was almost an entirely even split between the five panels that were selected at the time. As a result of this, a decision was made to change the control that slides out the panel to also support which tab was opened on the inside at the same time. While this might seem like a logical and simple application of a button action, the framework that was used to develop this particular part of the UI wasn’t very user friendly, so it ended up being re-written by scratch. This is just one more example, though, of how we plan to change the browser based gaming experience. You can be sure if you click something in our game, something is going to happen you’re going to have to react to in one way or another. Our current round of updates have focused very heavily on our user interface – and there is a very good reason for this. (Stay tuned for our upcoming blog post titled “One Click, One Kill” for more on this!) We really want the user interface itself to reflect our game, and also to be user friendly at the same time. To this end we’ve spent a lot of time looking at new users interactions with the game – not an easy challenge when you consider there is a finite amount of people who are new to the game. If the user can’t figure the action out within three seconds of us asking him or her to accomplish it, the element in question gets careful reconsideration for improvement. In one of our old games, a series of drop downs let you fire a torpedo. This was changed later to a list of buttons, but this list of buttons was not anywhere near to the targeting box. This meant that when selecting a target on the combat grid, you were two or three hundred pixels away from the box you needed to click on to fire a torpedo at your target. We’ve fixed all of this with floating HUDs, which we are not quite ready to show you yet, but which look pretty damned cool. The way the floating HUDs work is very simple – a red circle is oriented around every enemy ship on the map and on your mouse hovering over that target, a simple “Select Target” button becomes available. Clicking this will lock your ship onto that target – henceforth all weapons fired will zero in on that target, and that target alone. A red text box will tell you if you are out of range, and change to green (immediate visual feedback) when you enter range, and a the “Select Target” button will become a “Fire Button” that when clicked, translates into a dropdown menu where you can select which tube to fire. We’ve gone from a one second delay between targeting and firing to a zero second delay – and an unintuitive user experience has changed to something even a child could grasp simply. While a one second delay doesn’t seem like very much, if there are ten ships in the fleet you’re engaging that’s ten lost seconds to shoot at each of them once – twenty to shoot at them twice, and more if you’re also engaged in other actions with your ship (which we desperately hope you are – this is a stealth game, not a charge in and start firing! [Developers Note: You have to wait for SSF for that!]). Friday we’ll be posting another update about some of the more passive systems you use and how we’ve been updating the UI to more properly handle them. Until then, Sink Enemy Shipping!